As professional awarded wedding planners in the Algarve we know that planning a wedding abroad can be overwhelming so for us the main goal is to help you enjoy planning your wedding in the Algarve as much as the special day itself. We can assure you of a top class service leaving no stone unturned. We are passionate about our job and ensuring your wedding is perfect. With a professional, personalized and enthusiastic attitude, we assist you throughout the planning process and we will be there on your wedding day to ensure that everything runs smoothly, so you can just relax and enjoy your very special day with your families and friends. We have loved working with Sonho a Dois the wedding planning took 11 months total and we were lucky to have meant with Marisa in the UK, Manchester early on in the process when they came on their wedding tour. She gave us lots of information and ideas to think over and we scheduled Skype calls over the following months. They are amazing and very busy during wedding season as our wedding was in Oct at the very end of wedding season we couldn't always arrange appointments as often as we'd have wanted (everyday haha). However email was available at all times, We worked with only Marisa which was good consistency the whole year long! She was amazing :) On the day we had a brilliant time, the wedding was seamless and Marisa wad there all day! We would do it again with Sonho! If I could give 10 stars I would! We had the most amazing wedding day thanks to the lovely ladies of Sonho A Dois. It was an absolute pleasure to have met these ladies who planned our perfect day. Not only are they professional but they are SO friendly and welcoming! We now call them our friends and will keep in touch with them. We had Sandra look after us, who was so helpful with everything from the paperwork and legal documents to the finer details like the seating plan. They have a wealth of knowledge to advise and suggest on your day as well as knowing the best suppliers in the area. No task is too big or small.. They will do almost anything to help you! They are organised and on the ball. But most importantly, they genuinely care about you and making your dream come true. This is all they care about... Making your day perfect. They will get to know your vision so they can make it happen. Once it's all over they are genuinely over the moon for you! I can't recommend them enough if you are getting married in the Algarve. If you are just looking and don't know where to start just contact them! I highly recommend these guys if you are planning a wedding in the Algarve. From our first meeting we knew we were in good hands. Sandra was born to do this - she is so professional and you can tell she has a passion for what she does. Nothing was too much trouble and we knew she would only recommend the best suppliers. Communication was excellent and we were never left waiting for a response. On the day of the wedding, everything was beautiful and ran stress free and if there were any problems I didn't know about them which is how it should be. We really couldn't have asked for more and are so glad that we chose these ladies to plan our wedding - worth every penny! We got married on the 1st July 2018 at a beautiful private villa just outside of Albufeira. Well, what can we say..... From the our first meeting with Noelia, we knew we would be in safe hands and Noelia and her amazing team, really didn't disappoint. We had just under 10 months to organise our wedding day and Noelia ensured that everything went as smoothly as possible to make our dream wedding a reality. We trusted Noelia with all of the recommendations from the caterers to the florist to the band and the most beautiful private Villa in the whole of the Algarve. For many reasons, we wanted our day to be the most magical day of our lives and we honestly do not know what we have done without Noelia. She was there for us from day one.... on messenger and email and any ask and/or question was never a problem. We have the most amazing memories of our day and it's all down to Noelia and her team and for that, we will be eternally grateful. Any couple looking for the most perfect Wedding Planners do not need to look any further.... you will not be disappointed! We can not recommend Noelia and the team at sonho a Dois enough!!! They were professional, supportive and amazing from start to finish. Nothing was too much trouble and I can not believe the perfect day they gave us. Noelia was just fabulous she ensured we had the most perfect day and most of all without any stress involved!!! Can not recommend these enough! You won’t be disappointed!!! And if you go the Algarve you have to see this venue it truly is fairytale wedding and meets all expectations and more! The staff are so helpful and wonderful nothing is too much trouble they really make it an enjoyable experience and day!!! Excellent, excellent, excellent...I really can't say enough how wonderful Sandra from Sonho a dois was. She helped with every single part of our wedding, from finding the venue to all the minor details and made it the most wonderful day ever, without her we never could have done it. If you are considering getting married in the algarve don't look any further than Sonho a Dois, we would 110% recommend them. Fantastic job! So glad we found these professionals! Marisa was our agent. From the beginning, she provided a lot of different options. The communication was great: often skype calls, on time emails, good advices. All our dreams came true!! !It was fantastic!There is nothing we regret about. Awesome job! Thank you so much!!! Thank you Carla for helping us organizing our wedding! We really enjoyed every second of it! Thank you for taking the time to always answer our questions and be available. We had the best time ever! Marisa was brilliant, she went above and beyond to make our day absolutely perfect! Our brief was intimate, simple and elegant and everything was just that. Marisa provided some fabulous ideas and reassured us every step of the way. We put our trust in her and it certainly paid off! Would definitely recommend the girls at sonho a dois! We can't thank Sandra at Sonho a Dois enough for all her help to co-ordinate our wedding in Portugal. Having booked the venue first ourselves we initially only sought their services to help with the legal side of things as being UK citizens we felt it would just make things easier. Sandra ended up being a constant source of help to us. She would reply to all my queries within a matter of minutes sometimes even when they did not necessarily warrant a quick reply. We got married legally in Portugal which required us to provide a number of different documents at specific times to meet deadlines. Sandra ensured we knew what needed to be provided & when. She took us to meet the registrar prior to our wedding at the council offices in Albufeira. Sandra recommended a florist and co-ordinated this visit also, picking us up and taking us to meet her whilst on a visit out to Portugal prior to the wedding. Every query we had went through Sandra at Sonho a Dois. It was all very smooth and efficient. On the wedging day itself Sandra was here, there and everywhere for us. She delivered buttonholes & corsages to 3 different places in the afternoon. She helped the florist set up the venue, laying out name places etc we had made. She was there to greet John & the registrar & then there to meet me before I walked down the aisle. I wasn't sure I needed a wedding planner at first especially as I thought my wedding was fairly low key but because it was abroad and I was quite detached from a lot of things having Sandra was so re-assuring. I'm so glad we decided to use their services and I really don't feel we could have done it without them. We had the best day ever & we will always be so grateful. Thanks to Sandra at Sonho a dois we were able to have the wedding we had dreamed of. From day one she was there to help with every aspect of planning and took all the stress away of planning a wedding. I can't thank her and everyone else at Sonho a dois enough for all their hard work. I would recommend them to anyone looking at a wedding abroad, The whole experience was amazing ending with a perfect wedding. We couldn't recommend Sandra and Sonho a Dois anymore to plan your wedding abroad. Since the moment I enquired about a destination wedding until the evening of the wedding Sandra has been with me every step of the way. She took the time to listen to our ideas of what we wanted and organised everything we wanted to make our day perfect. We couldnt be any happier with the service provided. From meeting us in Manchester just to put a face to a name to showing us venues in the Algarve; Sandra has put up with my constant emails and questions and changes to things I wanted and has done it all gladly. We also had fabulous photographers, videographers, florist, dj, and our venue hotel São Rafael Atlântico was breathtaking with a beautiful overnight stay. We will miss our lovely Sandra and have made a beautiful friend and hope to keep intouch and meet up during our next trip to Algarve. Fabulous wedding planners who really care about making your day perfect ???????? The girls at Sonho A Dois are the best you will ever find. Noelia looked after me and my new wife like we were the most important people ever. Everything we asked for she sorted wiothout fail. She provided us with the most magical day we could ever have asked for and provided memories forever. She really has become a good friend to us and we will forever be grateful for what Noelia and the team have done for us. From the moment that we decided to get married in Portugal and contacted Sonho a Dios in June 2015 (after reading all the fantastic reviews), nothing was ever too much trouble for Sandra and even during our stressful times, she would make recommendations when we couldn't decide about things and would keep reassuring us that everything would be okay. Any problems that's arose, Sandra dealt with. We met Sandra in Portugal in September 2015 to look at venues and discuss our thoughts for our big day - Sandra worked tirelessly through things so that we could have the day that we wanted. Everyone that Sandra recommended from the venue, caterers to the florist, DJ, photographer and the registrar were perfect! Everything went to plan on the day - it was so well organised even down to the timings. Sandra made sure we were both as relaxed as we could be on the day and was running between the 2 hotels to make sure that we were ok. We had the best day of our lives and didn't want it to end. All our friends and family said it was the best wedding that they had been to, down to every little intricate detail We now have a friend for life in Sandra. Such professionalism and organisational skills from Sandra, her team and the florist - what a fantastic group of people. Wouldn't hesitate in recommending Sonho a Dios to organise your wedding in Portugal - they are brilliant! Sandra was our wedding planner and from start to finish she did an amazing job. Nothing was too much, as soon as I had any questions regarding the planning she replied straight away. The day went without any problems and all off our guests enjoyed the wedding. Sandra made an effort to meet all guests and everyone loved her. We cannot thank her enough!! Words cannot express my gratitude for Sandra of Sonho A Dois. My wedding exceeded my expectations and created life long memories for my husband and I and our guests. When we met Sandra her sunny disposition instantly confirmed that we were in good hands and gave us every confidence that she would plan our day to perfection. Sandra took us around a few venues and quickly secured our date once we decided on Sao Rafael Atlantico. We had a vague idea on our expectation for the wedding from décor to schedule etc and Sandra was able to transform our small ideas into what ended up being an intimate, fun filled, beautiful day. No request was too big to be dealt with and she always came back with options that eventually fitted together perfectly. A lot of assistance was offered in regards to the legal documents required and we were kept well informed throughout the whole process. Sandra was present on the day shuttling between my now husband, guests and myself to ensure that everything was on track. She was also able to deal with my last minute bridezilla request and kept me at ease in all aspects of the day including the weather. Sandra’s close attention to detail and fabulous organizational skills were also noticed by our guests including my Mother who still speaks highly of her. Her presence during the day gave my husband and I the comfort that everything was under control which meant that we could then enjoy our day. I highly recommend the use of Sonho A Dois as they made a significant day absolutely amazing! I will be eternally grateful to them and Sandra. I cant recommend Sonho A Dois enough. My wedding day was just perfect. There was no stress on the day. When i first met Noelia in 2015 i knew that day i was in safe hands and my day was being organised by a professional. 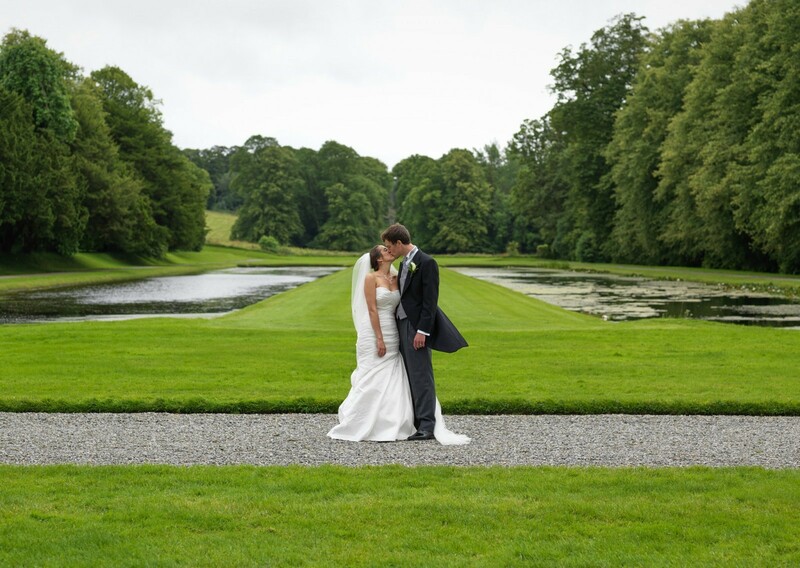 With living in Northern Ireland and having my wedding in Portugal, Noelia and Sonho a Dois took care of everything . They even brought the florists, photographers, dj, entertainment and makeup artists and hairdressers to me to meet in Dublin. They covered every little detail. All the extra touches that i hadnt even thought of for the wedding day was covered from the centre pieces the table plans. They were just amazing. You build such a beautiful relationship with them that they manage to know everything about you and your groom that would make you special day just perfect. My dream wedding became real thanks to Sonho a Dois! Since the first time we met in Algarve, Carla (from Sonho a Dois) showed to be super friendly and professional - not only she was super easy going, which is good to know that your wedding planner won't be opinianated!, but it was also obvious that she had a lot of contacts in Algarve and could make all our wishes come true. 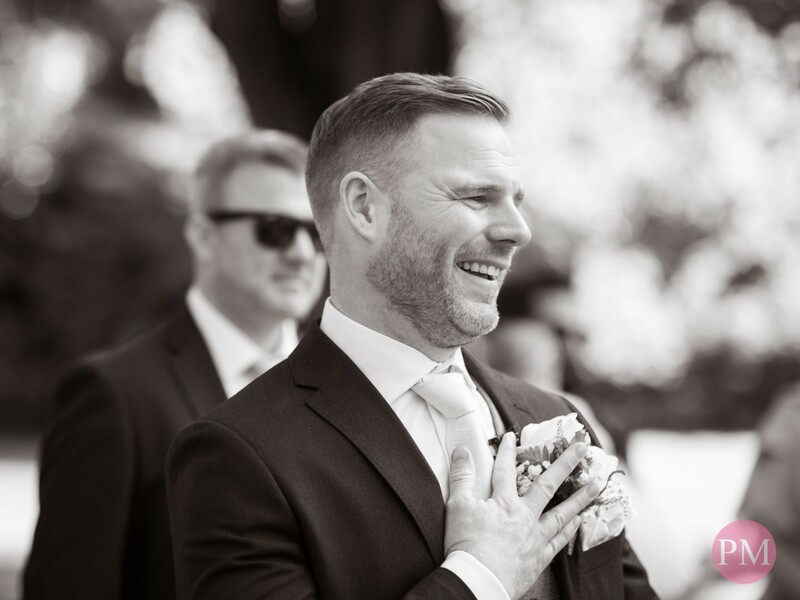 We found the experience really worth while and it brings you a lot of piece of mind, particularly when you live so far away from the place you are getting married into - she always replied promptly to our emails or texts and she would always find potential solutions for all requests within a couple of days! The must for me was that every single detail in the big day was exactly as planned - there were no nasty surprises in the day and even things we've chosen by combining different pictures (like table centre pieces) were absolutely like we've requested. She is also able to give you suggestions on things she's seen in different weddings, if you ask for it and only if you ask for it. Ours was not a traditional wedding as we got married in the beach, literally in the sand, but throughout planning all was so smooth that it looked like this was being done everyday! The setting was also absolutely gorgeous, looked like it was taken out of a catalogue! Sonho a dois also made sure that the person completing our wedding register was super nice, giving a personal touch to the civil ceremony, as they tend to be very doll! I absolutely loved my wedding day, it was exactly how I have dreamt and is mainly due to Sonho a Dois! For all they do, it is NOT expensive at all - I would definitely recommend their services to everyone, including any sisters (if I had them!). We planned everything through Sandra at Sonho A Dois. I can not praise her and her team enough. Everything on the day was perfect. She was a fantastic support and help from initial enquiry through to the end. All the planning was made easy and our day was over and above what we dreamed it would be Thank you. We were in contact with Sandra from Sonho a Dois for over a year from England, she made the planning of our wedding both relaxed and stress free! Her help and professionalism through out the whole process could not be beaten, we can't express how thankful we are to Sonho a Dois for literally giving us the best day of our lives! The contact Sandra had with us was excellent, the help with finding a venue, band, meal choice etc was amazing! We really couldn't have organised the day we had with out her! Excellent friendly wedding planners who made our day perfect and exactly how we wanted It to be. They were always quick to respond to emails and went above and beyond for us, even with our last minute changes. They use a fantastic group of suppliers, our food was the best BBQ banquet we have ever had and the disco with dj tiggy was out of this world!! Thank you so much Noelia, Sandra and co. Thank you to the best wedding planners in the business! Noelia made all our dreams come true & we had the most magical day. There aren't enough words to describe how thankful & impressed we were for everything that they did! If you are planning a wedding in Portugal there is no better place to start than with Sonho a Dois! We are just getting back to reality after our amazing month away celebrating our wedding in Portugal and honeymoon in Morocco. What a month! Noelia (with Carla and Sandra) from Sonhoadois organised our rustic Algarve seaside wedding to perfection. We had 2 ceremonies (outdoor civil & indoor church), icecream cart, cocktail & canapés hour outdoors and finally our seaside restaurant reception. We met Noelia in Dublin on 2 occasions, & in Portugal 3 months before the wedding where we saw our venues. Thanks to the endless and relentless emails (she must have the patience of a Goddess!) , everything was finalised which resulted in the most chilled out bride on the day! Blue skies, no breeze, low tide and a full moon- she arranged it all. All our family and guests still gushing about the "surprise after surprise" on the day. Thank you Noelia. Michelle & Adrian. A MASSIVE thank you to Sonho a Dois. Noelia was our wedding planner, and what an amazing job she did! We found Sonho a Dois after a recommendation from a Portuguese hotel – I had not thought of getting a wedding planner, but Noelia has been the BEST wedding planner ever! She has made the journey to our big day a smooth and easy one. I have found planning our wedding, even with the distance between London and Portugal to be simple. We booked our wedding on the Algarve in September 2015, after advice and guidance from Noelia, despite not having visited the area before. Noelia instantly understood what we wanted, needed and would suit us, and within 3 hours of being introduced to them (by email), we had booked. We visited the wedding location, and met Noelia, in December 2015. We were not disappointed. Our wedding on the 1st June was PERFECT. We had the most amazing day, made all the more simple by Noelia, who catered for every eventuality. The location was perfect, the flowers were amazing, as were our photographers - who relaxed us, engaged with us, and understood what we wanted! All our guests were amazed by the wedding, and have not stopped telling us how much fun they had! I cannot recommend Sonho a Dois and their planning expertise to you enough. They are BRILLIANT! You will not regret a decision to use them as your planners. From our initial enquiry, Noelia and the whole team at Sonho a Dois were so helpful. Before we had even signed a contract Noelia met with us in the Algarve and took us to see several venues giving us the pros and cons in her experiences with each of them. Once we had decided the venue, booked a date and secured their services, Noelia helped us arrange the details every step of the way. She recommended suppliers for everything from bands to photographers (and gave us her thoughts on any we found independently), liaised with them for us unless we wanted to talk to them directly, and nothing was ever to much trouble. For things like the cake and flowers, we just had to send her a photo of what we would like and she would give us a quote for it. It was very useful to meet her and some of the suppliers when they came to England to do a wedding fair as it helped discuss ideas, and she arranged hair and makeup trials, menu and cake tastings, and an engagement photo shoot for us when we went to the Algarve again a couple of months before the wedding. She really took so much of the stress and hassle out of wedding planning, keeping track of the budget, due dates for payments, planning the schedule for the day itself and coordinating everything else. On our wedding day she was on hand to sort everything out for us so we could just focus on enjoying it. She even advised us on the weather and reassured me it would all be fine (which it was, we had lovely sunshine) when we woke up to an unexpected thunderstorm! She worked with us to make sure our day was everything we wanted and we could not have asked for a better wedding planner. From the moment Sandra first replied to me I felt safe in her hands. She was professional, friendly, honest and had a genuine interest in making our wedding exactly what we wanted. She is full of ideas and nothing is too much trouble. By the time our wedding came around Sandra was like an old friend not our wedding planner :-) . The whole time it felt as if Sandra was only organising our special day and no one elses. The time she puts in and attention to detail are outstanding, I can not recommend Sonho A Dois enough. Our day was amazing, we were relaxed and chilled out knowing that everything was being looked after and overseen by such a competent lady. In our eyes the day could not have been any better and many of our guests commented on what a brilliant day it was and how perfect everything was. I would love to take credit but most of it is due to Sandra. She also arranged a next day BBQ for us and our guests in a beautiful venue with amazing fresh food. Yet again this was wonderful, everything went smoothly and the food wow! Sandra was still permanently on hand in case us or any of our guests needed anything at all. The Sonho A Dois team are very experienced and I am sure you couldn't do better than using these caring hardworking ladies to help plan your wedding. We've booked with Sonho a Dois in January 2015 with our wedding in September 2015. Best wedding supplier decision ever! Sandra has been just amazing all the way through our planning process and has been an absolute star during the day. She is incredible lovely, calm, organised and nothing is too much. She picked us up from the airport, drove us around to suppliers, venues and even to Villamoura for a night to see our wedding band play with us (we were in Carvoeiro, about an hour away!). The suppliers also were lovely and so patient and supportive. Everything went so smoothly and her experience and contacts have been essential for our big day. It was everything we hoped for and better - all our sincere gratitude to these amazing people. We definitely hope to see Sandra again when we visit Portugal next time, highly highly recommended! Sandra looked after us from start to finish and was a pleasure to work with. We couldn't recommend their services more and their hard work ensured we had a perfect wedding in the Algarve. My husband Liam and I celebrated our dream wedding on the 13th of July 2015, surrounded by our family and friends with the amazing back drop of Vilamoura, Algarve, Portugal. We would not have had our dream wedding if we didn't have the never ending, any time help of the amazing wedding planners of Sonho a Dois!! Liam and I already had high expectations when we hired Sonho a Dois after enjoying my best friends wedding in Vilamoura two years previous which the girls also organised. Sonho a Dois did not disappoint, they went above and beyond our expectations. Sandra was the planner assigned to our wedding and from the beginning she was a dream to work with. Sandra was easy to e-mail and before long I did not see her as my wedding planner but also my friend. Some people find weddings stressful to plan when at home never mind going abroad but I can honestly say that we never had one moment of stress and completely enjoyed the whole experience. No matter what I suggested or asked for when e-mailing Sandra she had it organised and booked in no time, Sandra also had loads of suggestions of things we could do or might like and always kept us updated of any progress. 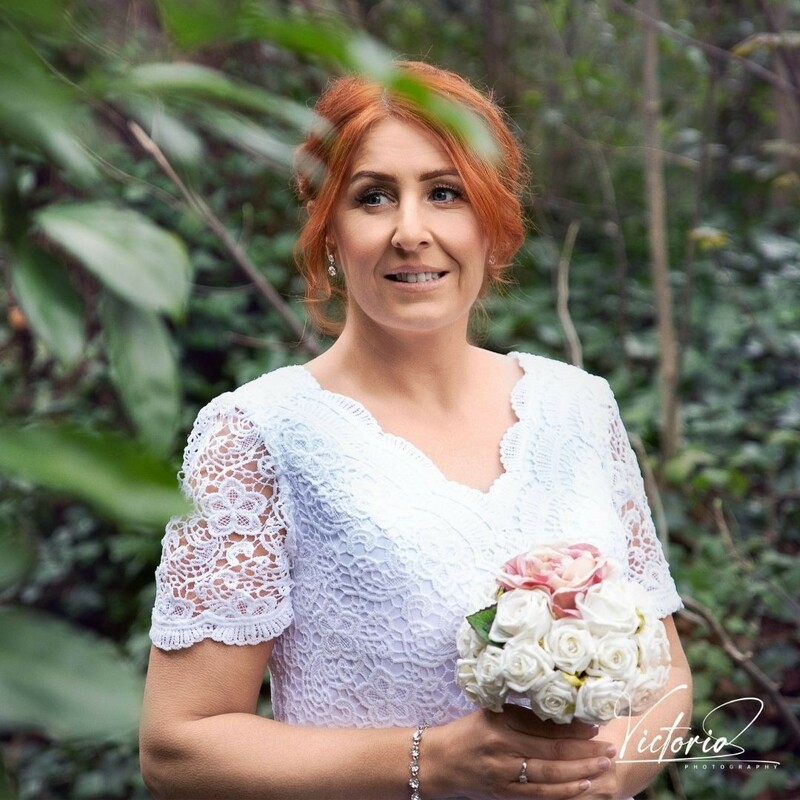 When we arrived in Vilamoura for the wedding after countless e-mails we finally met Sandra face to face and it was like greeting an old friend, we felt completely at ease and safe in the knowledge that Sandra had our wedding plans in hand. We also had booked a pre wedding BBQ which our guests are still talking about, suggested by Sandra. It was a great way to break the ice and by the time the wedding day came about our guests were not only in holiday party mode but they were all dying to see each other to continue on the fun of the BBQ. Liam and I got married in the beautiful Estoi Church, followed by ice cream cart outside (another one of Sandra's suggestions which our guests just LOVED) We had our BBQ and our wedding meal and party in the amazing private villa Casa Do Campo. Sonho a Dois work with suppliers of the highest standards and they are the friendliest people we have ever met who aim to make you as happy as can be. I had brought a few personal decorations over with me from Ireland that I had wanted on the day of the BBQ and wedding. Sandra listened to our ideas and on the day of the BBQ and wedding we didn't need to think of anything. My decorations were hung, our visions of our BBQ and wedding day came together perfectly before our eyes and Sandra was there every step of the way, in the background working tirelessly, going above and beyond making sure everything went to plan and our guests had an amazing time. Everyone is still talking about how amazing our wedding was, how they had a brilliant time and it was the best wedding they had ever been to!!! This is all down to Sandra and Sonho a Dois!!! We cannot say thank you enough or recommend them enough to anyone thinking of marrying in the Algarve!! ???????? Review by Mrs Eckersley ???? Carla who works at Sonho a Dois was absolutely incredible. From the first day that we met her in Manchester we knew that she was the one that we trusted to make our special day the most amazing day we could possibly of imagined. She is such a professional and was always there to answer questions and make possible everything that we wanted. The whole day was magical and all the guest have not stopped talking about how it was the most perfect day, "something out of a film" they have said. We would highly recommend her to everyone and we are so glad that we chose her to plan our day. After getting married (twice) and attending many weddings, the most important tips I would share with anybody planning a wedding (at home or abroad) are 1: Hire the right wedding planner and 2: Have a dependable babysitter lined up - that's if you have children. These two things will allow you to enjoy your wedding to the full, instead of having to run around working and worrying. Trust me, there is no point having gorgeous flowers and an angelic dress if you are too busy to notice or enjoy them. A good wedding planner is a must because on the day they will do everything you need, it's their job to make your day run smoothly and protect you from any worries or stress. It really was the best investment I ever made. I didn't realise it until afterwards but so many things had to be smoothed out on my day. My wedding planner dealt with mum in law's hissy fit, missing guests, a registrar under pressure to head to another wedding and who knows what else, beyond all reasonable anticipation or control on the day. But I didn't know any of that until days later, when other family members filled me in! Sandra never mentioned any hassle at all and looked as calm as the perfect blue sky on the day. I just breezed through the most perfect, idyllic day I ever had : if Sandra hadn't been there I know I would have really struggled to enjoy it as I would have stressed out. Not only that, but Sandra's expertise meant the vendors all worked together seamlessly because she had co ordinated them all so well. And they were all really professional and helpful and excellent at their jobs. Even though I am a great organiser (it's my job to organise many events) I could never have managed that at such a geographical remove or without having good Portuguese. I actually suspect it saved money too and definitely saved so much time - but it was very definitely the best money we spent on our wedding. Now, if you are thinking of parting with hard earned cash on a planner, the next question is which one? The Algarve is brimming with planners all eager to take on business. I spoke to (I think) them all. The team I chose was Sonho a Dois. Initially I gave a budget well below what we had expected to spend to each of the planners I contacted. I told them what I wanted - an idyllic beach wedding, brimming with exquisite flowers, five star service but not stuffy : laid back luxury at its best. My expectations were high. Some of the planners started sending me venues that were triple my budget, others disappeared altogether - as if I was too much work! But it was a calculated move on my part - I wanted somebody who would work with me within budget, not somebody who would pressure me to spend more, not somebody who would judge me on spending power. The girls at Sonho gave me options and recommended the Suites Alba Resort and Spa in Albandeira (on a gorgeous, secluded little beach with a beautiful arching cliff). The hotel's website doesn't do it justice in fact and I turned it down initially - but in quite a brave move Sandra asked me to reconsider, reassuring me that Suites Alba had everything I wanted - superb staff and mouthwatering food as well as the beautiful natural surroundings, and a feeling of privacy and exclusivity. I looked at every single option and read all the reviews on Tripadvisor and dozens of other sites. Eventually I was persuaded to trust Sandra - and she was absolutely right, it was a superb venue with just the right ambience - really great for Irish families, so friendly and all the staff acted as if nothing was too much trouble. Sandra also helped with all the vendor choices and again her recommendations were spot on. I was so grateful to her for finding and co-ordinating everything so well. The florist exceeded my expectations, providing baskets for our favours (port, pashminas and flip flops) as well as creating the most stunning pink white and peach peony, freesia, bougainvillea and garden rose bouquets for me and my four bridesmaids, white rose corsages for the mum's, peach rose buttonholes for the boys (including a mini one for our little boy). Every pew was decorated with pink peonies and white ribbons, the gazebo fluttering with white muslin pinned back with more peonies. Oh and the dinner tables? Overflowing with even more blossoms bursting from eclectic glass vases. I had said I didn't want too uniform and Sandra had made sure each table was just unique... yet all held together in style. Each table had a Portuguese town as it's name and the guests found their table plan hanging on a delicate almond blossom tree. So Sandra had the venue perfect. She also had the hair and make up team totally co ordinated. We had extra people needing hair and make up at short notice - taken care of, no problem! We had fussy people who wanted to change their styles at the last moment - no problem! 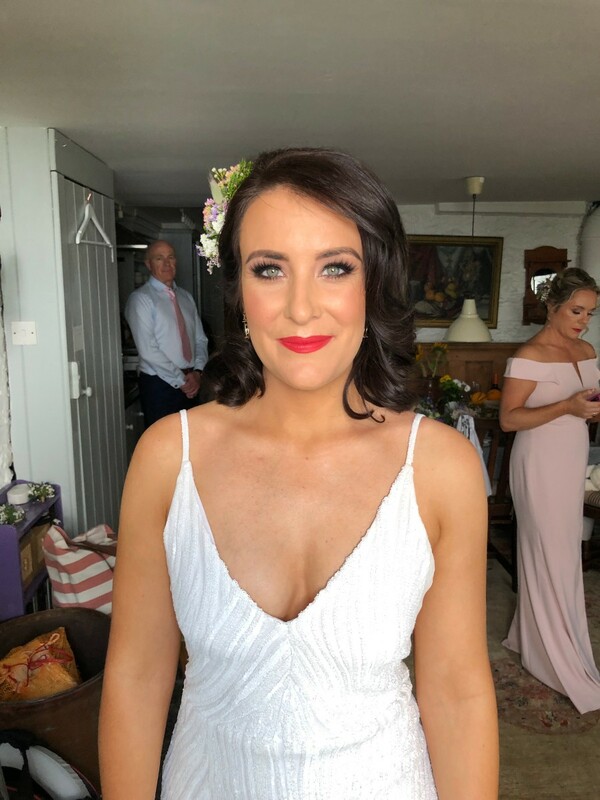 We had a mum of the groom who broke out in cold sores, and got sunburned the day before the wedding - the make up artist somehow managed to hide everything so well the photos look like there was nothing wrong at all. Honestly this could easily have gone so badly (and hysterically! ) wrong, but a dab had with concealer and lots of compliments from Sandra.... and mum in law felt like a princess. So - still need convinced? Well, Sandra managed to organise a breakfast for my daughter - I hadn't even realised she had missed it on the morning of the wedding. She also made a lovely fuss of her at my hair trial and gave her a full scale trial of her own. Oh and did I mention the fact Sandra gave us heaps of helpful tips on where to shop for groceries and which beautician mum in law should visit in the week of family holiday preceding the wedding? Nothing was too much trouble for Sandra. Actually, I almost forgot to mention the paperwork, which ought to have been a pain but wasn't - partly because Sandra had adroitly managed the paperwork process (so all I had to do was pop birth certificates and things in the post). In Portugal, she collected us by car and brought us to do the necessary meeting with our registrar. I was very glad that Sandra is a natural networker because the registry office staff were all smiles and politeness to us once they saw her. It was like being VIPs with a security detail - we just sailed through a huge queue of people and, after a flurry of Portuguese was spoken between herself and the registrar, he was so sweet to us and we were finished in no time. I had said from the start that I wanted a stress free event for me or my family - and my bridesmaids too. I wanted is to have fun and we really did. Nobody had any jobs to do on the day. The bridesmaids didn't even have chores or responsibilities - we all sipped prosecco and giggled and sang songs and laughed and joked together throughout getting ready. It was so relaxed! Sandra came to bring us down to the wedding area and I gave her a huge hug. She didn't feel like a wedding planner,she felt like a friend. She felt like a member of the big happy family gathered around me. Having worked for over twelve months together organising the details, having trusted her judgement and been wholeheartedly delighted with the results she achieved, having not got into any debts thanks to her constant monitoring of my budget... I was utterly stress free and ready to face the happiest moments of my whole life. I was so glad to have her there and that photo of her and me will so be in my wedding album! So there is not much more to tell about why you should choose Sonho a Dois but, when you call or email them, be sure to tell them I said hello and sent lots of love in their direction. Oh and very best of luck planning your wedding, I hope yours is as utterly perfect as mine was!!! We came across Sonho a Dois through online recommendation. As soon as we contacted them they were brilliant with information and helping us organise our dream day. By the time we went to Portugal to check out the venue we felt like we knew them always in contact with us through email etc. They are very one on one with you as a couple making you feel special also very professional. They were with us choosing and recommending everything from Flowers, Hotel, Food, Band lots of options. Nothing was a problem and always prompt to respond. They came with us for the civil ceremony organised the paper work we had nothing to worry about. They looked after guests arriving for the wedding if they needed transport even down to Babysitters for guests. For our wedding day Sandra was my wedding co ordinator. She was with me from 9am that morning till 1230 that night. We had nothing to worry about even when venue changed due to weather everything was flawless. We felt so laidback and able to enjoy the whole experience as everything was in their hands we just picked what we wanted. We would highly recommend them to create your dream wedding abroad. We would have no hesitation in recommending Noelia at Sonho a Dois. Our day was a fairytale dream come true and she made it all possible. If you are planning an Algarve wedding, look no further! Charlie & Sam, September 2014 I happened upon the Sonho a Dois website as I was trying to find some way to plan an Algarve wedding from London and it turned out to be the luckiest find I have ever made. A wedding is something that is very difficult psychologically to put into the hands of a stranger and trust can be a major issue, along with the “foreignness” of the whole thing. Would language be a problem? Do the Portuguese have ways of doing things and looks and styles that I would never want at my wedding? Would the team at Sonho a Dois understand what I wanted and would they be able to create what I asked for? I needn’t have worried because Noélia and her team created a day for us that just blew everyone away. It was amazing and it was entirely down to Sonho a Dois. The Sonho ladies seem to have some kind of sixth sense and know what you want and what you mean even when you can’t quite get it straight in your own mind. All the suppliers from the caterers to the venue owners to the florists to the photographers to the car suppliers have a huge amount of respect for the way the Sonho team works and are therefore willing to go that extra mile to give them what they, and therefore what you, want. The ones that aren’t willing to do that don’t last long on Sonho’s books. Noélia and her team took all the stress out of the eight months of planning, even for an impatient control freak like me. No detail was neglected and I never had to chase up emails or information. If Noélia wasn’t available then one of the others would always reply to me so I knew exactly what was happening and never had to worry. The whole process was so easy that I began to worry that I must have missed something but I hadn’t – Sonho a Dois had it all under control. On the day of the wedding Noélia and Sandra took complete control and everything ran like clockwork. Amazingly, however, once at the venue they just melted into the background and the only way we knew they were there was because everything was going right. There wasn’t a single thing we had to sort out or think about ourselves because the team had it covered, right down to getting the guests home again at the end of the night, and there were so many little details and extras that Noélia had thrown in throughout the day that it really was a stunning event, the like of which I’ve never experienced elsewhere. I didn’t have to “settle” for anything – everything was top quality and genuinely world-class. No compromises, no disappointments. It was perfect. It’s hard to find the words to adequately convey to a third party how utterly brilliant the Sonho a Dois team is and to reassure anyone trying to choose a wedding planner that you genuinely couldn’t get a better, more trustworthy, more professional group of people than the Sonho a Dois ladies. They are worth every penny (and more, in my opinion!) and really have to be seen in action to be believed. And like lots of other couples have already said (although you always assume this must just be an exaggeration, written while they’re still high on romance), these girls will become friends for life. It’s true. So thank you Sonho a Dois, from the bottom of our hearts. We couldn’t have done it without you and we wouldn’t have wanted to. Hi to all brides. I just got married on 21st of sep 14, I can't recommend these ladies enough. I had the pleasure of meeting Carla and telling her our idea of a good wedding and she listened and put us in touch with all the right people. She was always available to answer my long list of questions. Carla took the stress out of getting married which freed me up to party my socks off. Best money spent in the budget!!! Both our families and guests are still talking about our fantastic day which would not have been possible without Carla and her team. From start to finish it was totally stress free thanks to the girls. Nothing was a problem and the day itself ran without a hitch. Everything was so professional and we knew Carla was there if we needed anything.......even our guests were amazed by her!!!! I can't recommended Sonho a Dois highly enough, we found them on line 9 months before our wedding and it was the best google search ever. Hair trials, make up, flowers, photographer, sparklers!!! Were all sorted in one quick per-wedding trip and everything else done by email. We arrived on a Saturday and got married on the Tuesday and relaxed and partied until the wedding thanks to the girls with on wedding stresses to think about. My huge words of thanks are not half enough for this fantastic team and Carla for being so patient and kind. Thanks again for everything and see ye all soon. We found Sonho a Dois online only 8 months before our wedding and they did an amazing job helping us plan it with such a short amount of time! Nothing was too much for these girls, I probably asked about a million questions and I always got a prompt reply from them. We first met them when they came to Dublin & this was great as it saved us a trip to the Algarve. We arrived in Portugal 5 days before the wedding and Noelia and Carla worked so hard getting everything finalised including all the legalities, hair and make up trial etc. On the day of the wedding Noelia and Vera set everything up and it was just beautiful. Vera also very kindly video recorded the ceremony, which we are so grateful for! We couldn?t have wished for a more perfect day and this was down to Sonho a Dois, so thank you very much!! We would definitely recommend these girls, they will make your wedding extra special. To Noelia, Carla & Vera thank you so much for making our wedding day so special and a day we will never forget! From the moment we met you back in 2010 at Pat & Linda's wedding we knew we wanted to get married in the Algarve and you made that dream come true. We felt so relaxed from the moment we arrived, everything from start to finish was perfect! We couldn?t have done it without all your help, ye were just fantastic. Hopefully we?ll be back to the Algarve for another Sheehan wedding in the future!! Thanks for everything, ye are the best! Carla & Noelia , what can I say , words cannot describe how wonderful you were during our wedding planning and celebrations. Carla you were our rock , and you have to be the most patient lady on the planet!! You were so professional in every way and are clearly passionate about your job. In the weeks coming up to our wedding it was so nice not to be bombarded with stressfull calls and emails from suppliers. It meant that we could totally chill out and relax knowing everything was in Carla's capable hands in the run up to the wedding. On the day itself were able to enjoy every aspect of our big day and relax knowing that Sonho a Dois were on hand to ensure the smooth running of the event. And it really was smooth - everything flowed so well and Carla was like a little beaver in the backround making sure everything went as planned. We simply could not have achieved what we wanted without Carla and Noelia's hard work. What a fantastic way to start married life, totally stress free and happy! Thank you both from the bottom of our hearts , you were truly amazing and we will never forget what a huge brilliant impact you had during such a special time in our lives. Words can't sum up the lengths these girls went to to make our day magical.. Their attention to detail and work ethic ceases to amassed me. I have very high standards and these girls exceeded expectations in EVERY way possible. I can't thank you enough.If anyone is thinking about having that very special day in a stunning location, stop and just do it, trust me you will not regret it. We had 35 people at the very elegant Vila Vita Parc and everything was like clockwork!! Family & friends are still amazed at the layout, the flowers, the food, the makeup, the hair, everything was made possible and perfect by both these girls. Well what can i say about Sonho a Dois from the moment we got in contact with them they were so professional, informative and made us feel that our wedding was so special. We went out to portugal to meet Noeila a few months before the wedding and any worries we had soon disappeared as she was so helpful and professional. I was a little worried about all the paper work and getting it right but once i mentioned this to Noeila she wrote out a step by step guide of what to do and she was always only and email away if i had any questions. They took there time to get to know us and what we wanted and no request was to much trouble for them. 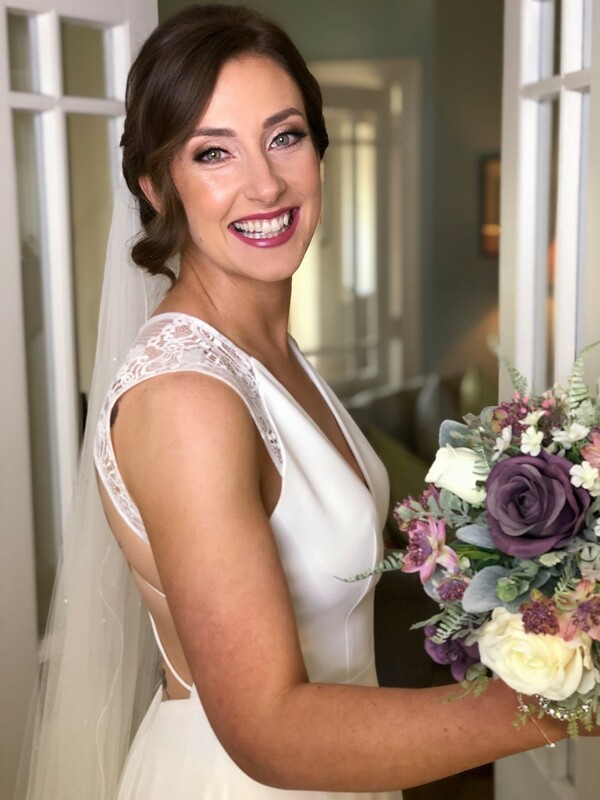 We were so happy with everything on the day of the wedding from the hair,makeup,flowers reception and the music everything went without a hitch and this was all down to the excellent planning and attention to detail fron Sonho a Dois. We were so relaxed and could enjoy our day without any worries. I cannot recomend Sonho a Dois highly enough if you are thinking of getting married in the Algarve Sonho a Dois are the wedding planners to use. We felt so lucky to have found them and would like to say a BIG THANKYOU to you for making our day so so special. We have just been looking at our wedding photos and they bring back so many beautiful memories of our wedding in Portugal in September 2011. It was around this time last year that we decided to get married in Portugal and flew over to meet Noelia and Carla of Sonho a Dois. I scrolled through WOL looking for the right wedding planners for us and when I came across the website of Sonho a Dois I began to feel that they could be the right ones for us. When I emailed Noelia and Carla and received their first reply, I knew that these were the people we wanted to work with in creating our Big Day. Eoin and I always knew that we would get married abroad however because Eoins Dad was unable to travel to Portugal, we had a celebration here in Galway and we had a civil ceremony in the Registry office here. That meant that we didn’t have to do the legal bit over in Portugal. 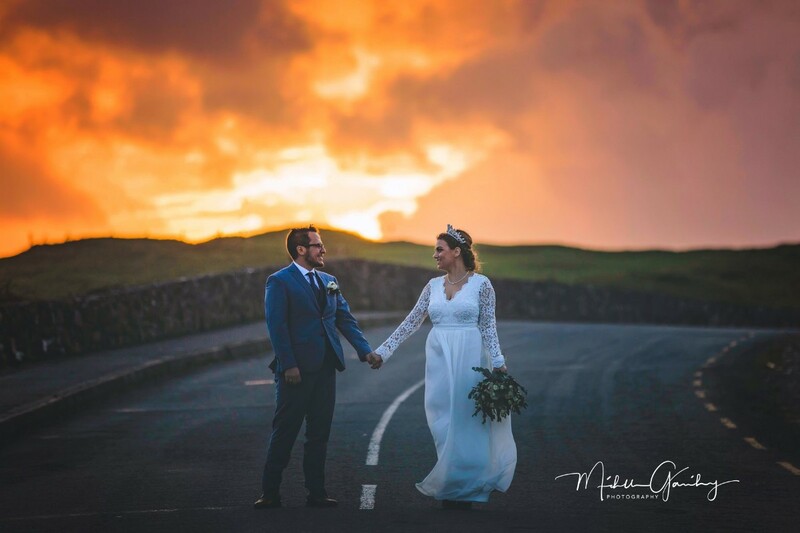 When I described the type of day and setting we were looking for, Noelia and Carla sent us lots of different options which included hotels, cliff tops, beaches but the wedding we wanted was to be in a garden with a marquee. So we travelled to The Algarve January 2011 to look at the venues. Arriving into the airport we were both feeling quite nervous as we had never met Noelia and Carla and had really only got to know them through emails. We were put at ease straight away with the typical Portuguese greeting of a kiss on both cheeks and off we went to the first venue with lunch afterwards. We chatted easily with the girls and I felt really happy that we were in safe hands! We spent 5 days out there looking at everything from venues to table settings. The girls even took me shopping for a wedding dress! When we arrived at Quinta das Figuieras near Montcarapacho I knew by the feeling in my heart and the look on Eoins face that this is where we would have our wedding. Even though it was a wet day in Portugal, we could really see the potential for a fabulous day. The garden was the perfect size for a small wedding. Sixty people travelled over for our wedding. We were shown different pictures of all the colour schemes the marquee had at previous weddings. We looked at menus and saw pictures of all the lovely food that Joao and his team created. When we left Figuieras and got back into the car, I felt so excited that we had finally found a place we both loved. That evening Eoin and I discussed the different venues and the only downfall of Figuieras was that it is 25 mins from the town of Vilamoura where we were planning to stay. But we didn’t let that get in the way. The girls were able to give us all the details we needed for buses and cars to and from the wedding. When we got home, I couldn’t wait to get cracking on the wedding invites. We had decided to get a caricature done of the two of us and put that on the invitation front. I found caricature.ie and got in touch with Drew who did a brilliant caricature of us and put in any detail we asked for. He made any changes we weren’t happy with. I did up a brochure of all the details people would need to travel to Portugal including stuff like airlines and airports to fly into, the meeting point of the bus, accomodation choices and just a little bit of info about the town of Vilamoura itself. We had also decided that with our budget we could have a bbq there so I included all that information too. We got great feedback from the invites and people were happy with all the info so I definitely would recommend putting in an information sheet for guests. It really meant that people weren’t ringing us with different questions. We also included contact details for Noelia and Carla so that people could get in touch with them too. Lots of the guests commented in the lead up to the wedding on how helpful andf friendly the girls were. It was so lovely for us aswell that people got to know them a bit and they got to know some of the guests. We took another trip to Portugal in April to do a food tasting, choose the cake and finalise table settings and centre pieces and of course one of the important aspects for us The Music. We had trawled the internet looking at bands of all different shapes and sizes. We had checked them on youtube but none were really standing out to us. So when we went back in April Noelia and Carla insisted that we go to see Twinflames playing. Now I have to say that we saw some clips of them on youtube and we didn’t really think that they were for us. We had both expressed this to the girls but they really insisted that we go. They even collected us in Vilamoura one night and brought us to see them in Albufeira where they were playing a gig. Well, to say that we were blown away by them would be an understatement. When Nicole and Tiago came out on stage and Nicole began singing her first song, I was almost in tears and I just looked at Eoin and he gave me the thumbs up and I looked at the girls and said thank you so much for making us come and see them. Both Nicole and Tiago are so talented and brilliant at what they do.And we were just thrilled that they were available the day of our wedding. We were two happy campers going back to Dublin as we had got through so much of the preparations in the few days. That is the great thing about Noelia and Carla, when you go over to meet them, they get straight into it, and they have all bases covered. They have appointments booked, arrangements made to meet people and alongside all of the hard stuff, there was just so much fun too. We laughed the whole time we were with them. They are both just so lovely to work with. Along with all these preparations, the dress was also being organised. I got my dress made by Sarah Foy Design in Clontarf. I had seen a picture on the internet and really loved the dress but it was very expensive so I decided to see if I could get it made for less. And I could. Sarah did a brilliant job on the dress. I was a bit of a stickler when it came to the colour as I wanted it to be a warm honey colour and every sample Sarah came with that I said no to, she just went off looking again. Sarah ended up going to London to get it and the colour she got was spot on. The dress was made exactly how I wanted it to be and the great thing was that it was a tailor made dress for me. I would highly reccommend getting a dress made because you don’t need as much time as if you were ordering it in a shop and also it’s just so much more personal. When the time finally came to go to Portugal we were just so excited. We flew over on a Saturday and I had my dress in my hand luggage along with Eoins suit. Anything that we could not do without on the wedding day went into the hand luggage and it just meant that we weren’t worrying about losing a bag! In the run up to the wedding there was great excitement. There were new guests arriving everyday into Vilamoura and it just made it so much fun. All of the guests had chosen to stay in Vilamoura and I have to say that everybody said what a lovely place it was and the thing about it is that there is something for everyone. Whether its a fancy hotel or apartment or cheap n cheerful, there was something to suit everyone’s needs. Noelia and Carla checked in with us everyday and brought us to the venue to do a run through beforehand. We had our friend say the ceremony and another friend do the music for us so we were lucky that it was small and intimate.My best friend read a beautiful poem during the ceremony which I had left for her to pick. Its amazing how people really get involved and enjoy being a part of your wedding day. There was no need for a major rehearsal. The girls rechecked everything with us and made sure that we had nothing to worry about on the day except getting ourselves dressed. On the day of the wedding(Friday 16th) myself mam and my sister who was also my wonderful bridesmaid had our hair done in the hairdressers underneath the Tivloi hotel on the Marina. We met the videographer Fernando but really after a while didn’t notice he was there. He just blended in and that was exactly what we wanted. Nickie from Blush photography met us at the apartment and again she just went with the flow and didn’t put any pressure on us at all. We had asked for natural shots and nothing too posey and that was exactly how the day went. When everyone left the apartment(except dad and sis) the photgrapher and videographer got lots of lovely snaps of the guests around the marina getting ready to go on the coach to Figuieras. There was also a minibus for the kids with safety seats so no worries there. I was collected by car along with dad and sis and we headed off to Figuieras. I was so nervous. So much thought and effort goes into your wedding day and I just wanted it all to go so well. The ceremony went beautifully and afterwards the guests had drinks and canapes while photos were being taken. Myself and Eoin snuck out for some couple shots while the guests enjoyed the Sangria. We sat down to dinner at around 6pm and had the speeches etc before the meal. The food itself was yummy. There was cataplana(traditional fish stew) for the fish course and beef for the meat course. The food was great and after the 4-course meal, a buffet was put on. There was lots of uneaten food which was the only thing I was sorry about. The food in the buffet was endless, everything from meat, to cheese, prawns to salads and every dessert you can think of! I think people were too busy taking advantage of the free bar! We had the cutting of the cake on a bridge at the end of the garden and it was lovely because everyone got involved waving a sparkler or two and having a toast of champagne with us. It was really a gorgeous way to do the cutting of the cake. From about 9pm Twinflames were playing and we had our first dance. We had requested a Paola Nutini song and we were nervous that they would find it difficult as its quite fast but no, they did a brilliant job of it. The guests were on the dancefloor all night long and so much fun was had by all. We got some great pics of all the moves! Everybody complimented Twinflames on there brilliant performance and people just kept asking us, where did ye find them? Well we had Noelia and Carla to thank for that. They truly know their clients and they knew what we wanted from listening to us and they made sure that we had the best band in the Algarve playing at our wedding. As the night went on, being an Irish wedding even in Portugal there was an oul sing song which lasted until the coach arrived to collect us. We were all dropped off at the Marina, right beside a taxi rank for those unable to make the walk home! We also arranged two minibuses leaving earlier in the night for guests who wanted to finish up at a reasonable hour! On the Sunday we had a bbq which was really another great day out. We had booked the coach to collect us all at 4pm on the Marina but when we realised that Dublin were playing in the All Ireland Final we had to change the time. Noelia and Carla sorted it straight away with no problem. They are both just so flexible and really make you feel at ease to change things if your unsure or if something comes up at the last minute. The bbq took place in Quinta da Pomona and I have to say it was just so enjoyable. The setting is fabulous, in an orange orchard and its very traditional. The music was great and we just danced the night away. Again we took a coach back and we sang all the way back. The driver even put on a karaoke which was hilarious and instead of dancing in the streets we were dancing in the ailes of the bus! As the week had begun with it being somebody’s first night every night, the week ended with it being somebody’s last night. We partied and celebrated every night and really had such a great time. It is such an amazing thing when people plan their holiday around your wedding and when all your friends and family come together in one place for a week or a few nights to be there with you and to celebrate such an important moment in your life and I have to say that it was truly a memorable experience. If I could, I would do it all again next year! I just want to say at this point that if anybody is planning to get married in Portugal I would really reccommend Sonho a Dois. Noelia and Carla are two honest, hardworking people who will treat your wedding as though it was their own. Even if I said I was happy with something and they felt that I wasn’t, they would call me or email me or in Portugal go for a coffee and ask us how sure we were about this or that. They have great instinct and they want the best for their clients. They will never take the easiest option, they only want the option that you are happy with. If you are looking for a planner who will treat your wedding like it is the most important day of their life well then I really recommend Noelia and Carla. To Noelia and Carla, thanks you both so much for making not just our day but our whole wedding experience such an amazing one. Beijinhos. Noelia & Carla, We can't thank you enough for planning our wedding ,It really was fantastic day. Everything was amazing from the Flowers,Hair and Makeup to the Music and the Church. Quinta Da Pomona was our perfect location, Staff and Food Were Fantastic!Our guests will remember our day for a long time to come. We look forward to been back in Algarve again possibly at another wedding by Noelia & Carla. Best wishes for the future. I guess this will be an unusual one to have a comment by the father of the groom. So here goes My son Graham and his now wife were the happy couple to get married and had Carla and Noella to plan their wedding with military precision. We arrived a few days before the wedding and were disappointed to find the Marquee sparse and undecorated. Our comment to the girls immediately sprang them into action calls were made and appointments arranged. I can only say the creative juices of both these girls were high octane. No detail was was ignored and every eventuality was planned for. Just to give one small example, the gardens of the hotel were stunning with mature vegetation waterfalls and lakes. To further enhance it beauty Noella suggest 200 small tea lights dotted around the trees and gardens it created a fairy tail scene which all the guests were awe struck by. At the cutting of the cake they had arranges for each guest to have a helium filled balloon which was released at the moment the cake cut. I personally felt the hair on the back of my neck stand up it was like a wonderful scene and a collective wow was expressed. I can not express our thanks enough to the girls for their hard work long hours in the night to make this the perfect wedding for my son and daughter in law. Their professionalism and creativity are unparalleled. Thanks you to you both with our best regards to you for the future. Sonho A Dois are our wedding planners for our upcoming wedding in May 2012, they have been amazing in helping us sort everything from the biggest to the smallest details, we are so excited and they are always there day or night with any questions or concerns we have had. We are confident that they are going to make our day so very special and so happy that we chose them to help plan our big day ! I got married in the Algarve on 15th Sept 2011 and we used Sonho a Dois, Carla & Noelia and I can not fault there service, they are just so accommodating, nothing was ever a problem, They are so professional and really organised and this is what you need in a planner, the service you get for their fee is above and beyond the call of duty, They think of everything, which leaves you to enjoy your whole day, I really can not say enough good things about them both. I always felt like I was the only bride they were dealing with because their service is really so personal. Thanks a million for making our day so prefect. So if your looking for a genuinely caring wedding planners in the Algarve look no further than Sonho a Dois. We recently used the services of Sonha a Dois for our wedding in Lagos in the Western Algarve, Portugal and we could not be happier. We met with a couple of other Algarve Wedding Planners before Sonha a Dois and although we were thinking about using them, we felt they were restrictive in some areas. We felt that we would be obliged to use certain suppliers of services like a specific band or photographer and we were not very comfortable about this. From the start Noelia & Carla of Sonha a Dois were so easy to deal with. Upon contacting them, they promtly replied and asked us the type of Wedding we would like to have. No stone was left unturned on the details on what we wanted for our big day. We then arranged to fly over to The Algarve to meet with them, visit various venues and discuss all the possible options. The girls were very friendly and welcoming and had prepared a detailed dossier of all the prospective venues and our timetable for the next two days. As we travelled around with them to the different venues we were full of questions. They had a great knowledge of everywhere that we visited and gave us as much information as we needed to make our decision. Upon our return home we were undecided between two venues. Many more emails and questions later and we finally decided on Duna beach Club on Meia Praia in Lagos with the ceremony on the beach. it was exactly the type of place we were looking for. From then on it was a case of arranging all the finer details of flowers, Transport, Music, menu choice. Any requests, questions or issues were responded to very promptly. Noelia & Carla are very efficient at what they do. At no point was there any frustration on our end as everything was dealt with in a highly professional manner. There were many occasions where we were very indecisive on many aspects of the planning and exactly what we wanted. The ladies were always very patient with us and gently nudged us towards getting those last decisions made and getting everything in place. The day itself went off without a hitch and was amazing from start to finish. We hadn't told our guests the exact location of the venue and that we were getting married on the beach, so it was all a great supsrise for them when they arrived at Duna Beach with the lovely views out to sea. Noelia & Carla had been around our hotel since early morning making sure everything was ok. They were on hand for the entire day and night to ensure everything ran like clockwork and did not leave the beach club until the last guest did (sometime around 5am!!!) We were so happy at the end of the night and so many guests remarked on how great the day had been. The next evening we all boarded buses for an evening of entertainment at Pomona which was set in the grounds of an orange grove near the beautiful town of Silves. The planners were with us all the way again. We had a fantastic evening of great food and entertainment of a band, Fado singing, and traditional Portuguese dancing. The guests were once again amazed and delighted with the evening saying it was perfect for the day after the Wedding. The Ladies wer on hand all night to make sure everything went like clockwork again (which it did) Everyone was very impressed how everything was organized over the two days with many guests saying it was the best Wedding they were ever at. We can highly recommend the services of Sonha a Dois. Noelia & Carla are very proud of the Algarve and what it has to offer and it shows it how they do their jobs. They were very professional from start to finish and made us feel very comfortable that they would be able to deliver and they did. There are many Wedding Planners in the algarve, but we feel that these guys really care about what they do and make the whole process feel very personal. We couldn't recommend Noelia, Vera and all the team at Sonho a Dois highly enough. 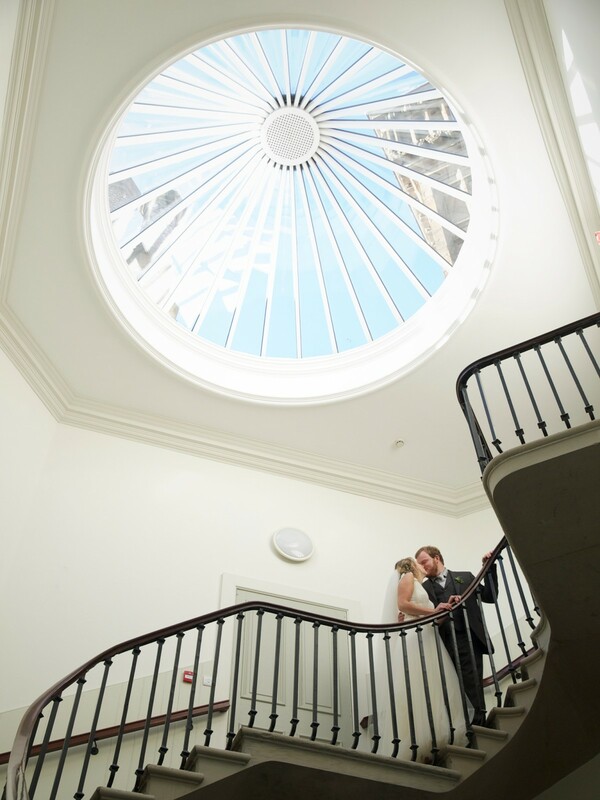 From our initial meeting in Dublin they have been flawless in their care and attention to detail in providing us with our dream wedding day. We travelled to Portugal twice before our wedding day and each trip was well organised with every last thing gone through and made sure we were happy with. As well as that, Noelia was always prompt on email with answers to any queries no matter how big or small. On the wedding day itself they were unbelievable. I don't know how they kept everything running so smoothly when you wouldn't even know they were there! All of our guests were so impressed with the high standard of absolutely everything and it was all down to them. We are so grateful to them for what they gave to us, it was more than we ever even dreamed it could be, a week we'll never ever forget, just perfect. Seriously, these girls know what they're doing, plus they're really sound! !